I was a little stuck. I needed to carve another bible box and I needed ideas and inspiration for the carvings that make these boxes so unique. With my previous attempt at one of these boxes I took the front Fleur De Lis pattern directly from Peter Follansbee's article on carving and building a bible box. I am very happy with the way that one turned out but this time around I didn't want to copy from as much as be inspired by. In the end I didn't completely pull this off, but I'm happy with the results at any rate. I wanted to show the pieces and carvings I took inspiration from and share the journey. 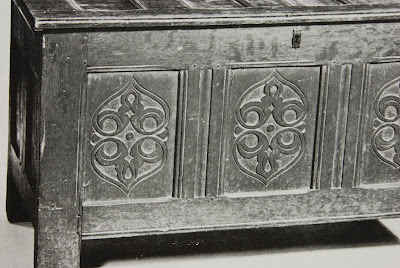 It really began with seeing this joined chest in the pages of the book "American Furniture: Understanding Styles, Construction, and Quality" by John T Kirk. (The Star Trek fan in me can hardly handle that name without saying something like "Dammit Jim I'm a doctor not an Anthropological Ornithologist) For whatever reason I was drawn to this opposing hearts pattern. At it's basic shape it's a riff on an "S" curve pattern, and I started to play with drawing the form and it evolved in my sketchbook. The original idea I settled on was to carve a double repetition of the pattern you see on the graph paper. Now I went and decided on my stock. My day job kept me from making a timely visit to my hardwood dealer, so I eventually made a visit to the closest home store. I was unimpressed with the oak in the stacks, severely unimpressed, eventually I settled on the species that passes for mahogany. I've used it before and it carves nicely as long as you have the a good section of board. I tried to pick as carefully as possible. The width of board limited me somewhat so before I started laying out the carvings on the stock, I cut some paper to width and saw how much stretch of board I would get. 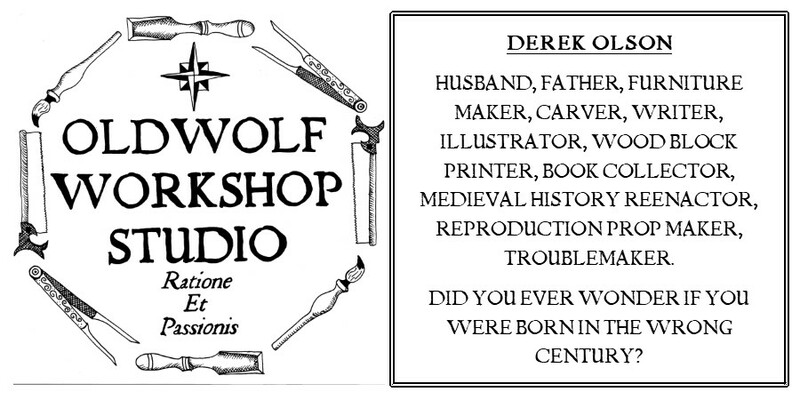 I didn't get a picture but the result was very out of proportion length of board in relation to it's width. Much more length than I wanted. So it was back to the drawing board for me. 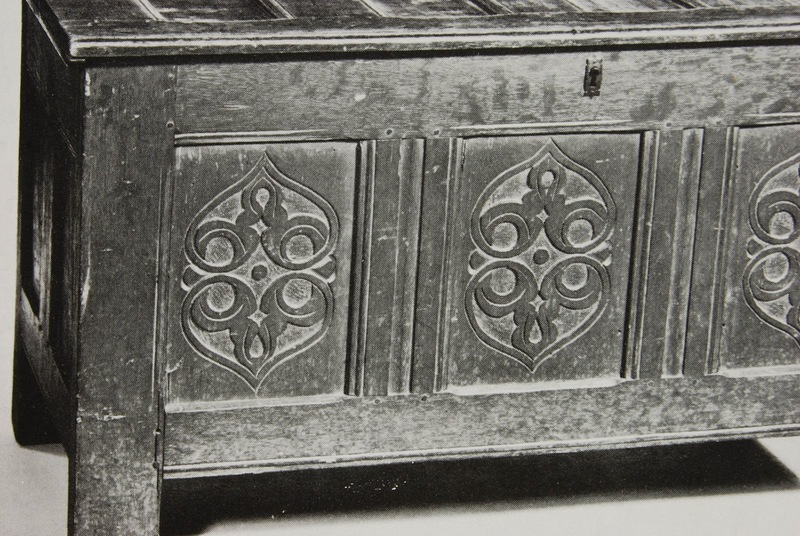 For my money, one of the best places to go for inspiration and just a general photo collection of 17th century carvings and furniture is Peter Follansbee's blog Joiner's Notes. After a little while cruising around his site I fell upon this picture. A "S" curve flanking a central circle. Now there was a great idea. I decided to go with it and try it out on another larger piece of paper. 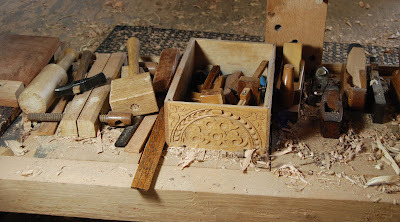 Now I was much happier with my proportions, I decided to go ahead and start carving. I cut my stock, planed it flat and smooth, and marked things out using a pair of dividers and a scratch awl. This is eventually where things ended up. The hearts turned out differently, but things like this take on a life of their own once you starts. From the front of the box I moved on to the side panels, Here is where I stumbled a bit. 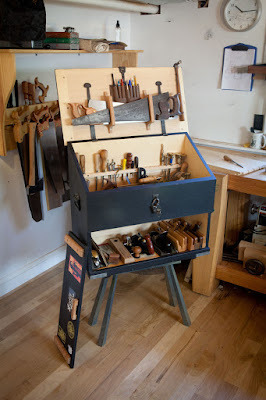 As I was looking through pictures on Peter's blog I came across this shot of a box he keeps under his bench to hold some odds and ends. 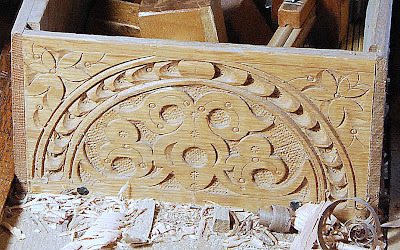 I fell in love with the carving. I had to do my own take on it. I carved a pair of these panels to flank the front panel, but when I attached them using traditional rabbets and nails I decided to turn the carvings upside down from the presentation Peter used. The nails I used are from Horton Brasses and are called Wrought Head Nails. they simulate blacksmith made nails and they really look great. I used the 1 1/2" variety (N-6). I shiplapped a couple pine boards to make up the bottom of the box and moved on to carving the lid. More on carving the lid next time.